Dating back to 1903, Medley Court is a luxurious four bedroom holiday cottage forming part of the Astor Wing, recently awarded a 2018 VisitEngland ROSE Award in Recognition Of Service Excellence, as well as ‘five-star gold’ rating by Quality in Tourism. 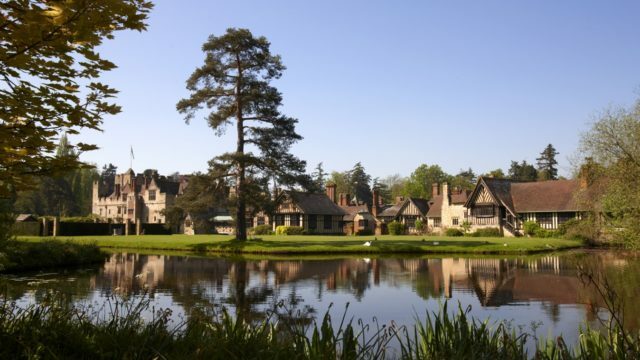 The charming, double-moated Hever Castle and surrounding formal lawns provide a stunning backdrop to this beautiful holiday cottage in a truly historic location. Although Medley Court is now just over one hundred years old, its appearance is that of a Tudor house, the standard of decoration and comfort is outstanding and it still retains the warm, relaxed feel of a family home. Whilst staying in this superb property, guests have the opportunity to visit the historic castle throughout the duration of their stay, once the childhood home of Anne Boleyn, Henry VIII’s ill-fated second wife and mother of Queen Elizabeth I. Guests also have the unique opportunity of access to the gardens and grounds during times when they are closed to the public, providing a unique opportunity to soak in the breath-taking views and scenery in complete privacy. Upon arrival, a member of the Astor Wing staff will guide you to the private driveway, check you into Medley Court and present a ‘Castle Kitchen’ welcome hamper to get you started. Bookings are available on a week by week stay however short stays are available on a short lead basis. Check in on the day of arrival is from 4pm and check out on the day of departure is by 10am. Sleeping up to eight guests, Medley Court offers four beautiful bedrooms: two en–suite ground floor double bedrooms and a further double (twin if preferred) and a small twin on the first floor which share a bathroom. The spacious cottage kitchen features state of the art appliances and a family breakfast table. The lounge offers a working fireplace and deep sumptuous sofa’s in which to relax, with views through leaded windows across the formal lawns to the castle. There is a cosy outside covered terrace waiting to be discovered from where you can while away the hours on balmy summer nights. We just wanted to say how much we enjoyed our weekend at Medley Court. It really was a special occasion for us and we found the property ideal. The grounds of the Castle are really beautiful and as you say the lake walk was lovely. All your staff were very welcoming and could not be more helpful - please thank them from us. We will certainly return to Hever in the summer when the Castle will be open for us to see round. I just wanted to thank you and your colleagues for such a wonderful stay at Medley Court, and to wish you and your husband all the very best for October. During our stay we were made so welcome and everyone we came across was so friendly. Of course, the accommodation was fantastic and comfortable. My wife, Denise, was so favourably impressed she would like another week’s holiday there in 2018, perhaps in June / July or September. We had the most wonderful week at Medley Court!!! It could not have been any more perfect. It was for my father’s 80th birthday and the first thing we found on our arrival was a beautiful bouquet of flowers and birthday card. How thoughtful, my father was delighted and felt very spoilt. Medley Court itself is stunning, the welcome hamper great, and everything has been thought of. It was a very special, very happy week, we have made memories we will treasure. We were lucky enough to stay at Medley Court within the Astor Wing at Hever Castle. It is an incredible setting and very well appointed with everything you would want, plus a bit more! Medley Court was big enough for one of us to actually get lost. Access to the gardens after hours was also brilliant. We're considering going back for Christmas!